Yair Rodriguez picked up where Conor McGregor left off as the most promising prospect in the featherweight division after he dismantled UFC legend BJ Penn in the main event from Phoenix on Sunday night. After an impressive run through The Ultimate Fighter Latin America, Rodriguez has put on a series of blistering performances capped off with his lopsided rout of Penn to win his sixth consecutive bout inside the Octagon. From the start of the fight, Rodriguez kept up a tireless pace as he battered Penn with a series of kicks to the head and body throughout the opening round. Knowing that Penn was dazed and confused after the opening five minutes, Rodriguez just poured on the punishment in the second round before landing another head kick followed by a punch that dropped Penn to the mat. Rodriguez followed him to the ground with a flurry of punches before the referee stopped the fight 24 seconds into the second round. The majority of fantasy players had this fight pegged before it happened, with 79 percent picking Rodriguez to win and another 71 percent predicting he would get the victory by knockout. Rodriguez came through with a stellar performance while notching a victory over a UFC Hall of Famer. The co-main event ended in controversial fashion after Joe Lauzon earned a split decision victory over submission specialist Marcin Held. While two judges scored the fight for Lauzon, even he disagreed with the decision and declared afterwards that Held deserved the win. Regardless of Lauzon's graciousness, he still walked away victorious, which certainly appeased an overwhelming lot of fantasy players, 87 percent of which picked him to defeat Held on Sunday night. Another 44 percent predicted Lauzon would win by decision, which was ultimately how the fight played out. The only upset on the main card came in the featured welterweight bout, as Ben Saunders returned from a brief hiatus outside the UFC to pick up a win over Court McGee. Only 38 percent of players pegged Saunders to get the win, but the veteran fighter was able to get the job done after three hard fought rounds with McGee. 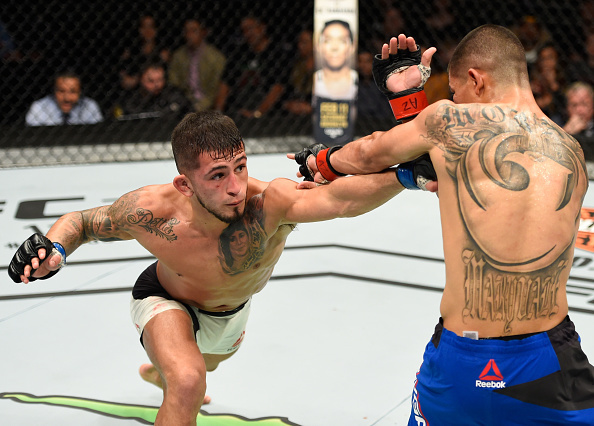 Sergio Pettis put on one of his best performances to date as he handed John Moraga a loss in the first bout on the main card on Sunday night. Pettis was an overwhelming favorite amongst fantasy players, with 70 percent picking him to win and a whopping 77 percent saying he would walk away with a decision victory. On the preliminary portion of the card, newcomer Drakkar Klose picked up an impressive win over Devin Powell. It was a slight upset according to fantasy players, with 47 percent picking Klose while 53 percent went with Powell. Meanwhile, August Mendes pulled off a similar upset in his fight with Frankie Saenz after 44 percent of players picked him to win. While two underdogs closed out the preliminary card, a pair of heavy favorites certainly did their part earlier in the night. Russian heavyweight Aleksei Oleinik locked up the first ever Ezekiel choke submission to put away Viktor Pesta after 77 percent of players picked him to win, while Tony Martin had to battle through three grueling rounds to get past Alex White after 70 percent of players selected him going into the night. On the early prelims, Nina Ansaroff got her first UFC victory with a very impressive outing against Jocelyn Jones-Lybarger. Ansaroff was a heavy favorite, with 75 percent of players picking her to win, and the American Top Team fighter looked better than ever with a third round submission finish. Heavyweight slugger Walt Harris also picked up a highlight reel finish as he got a knockout victory over Chase Sherman. Fantasy players pegged Harris as a solid favorite, with 73 percent picking him to win, along with another 73 percent saying he would get the job done with a knockout. All told, UFC Fight Night: Rodriguez vs. Penn ended with seven favorites getting victories on Sunday night while five upsets occurred according to the final picks made by fantasy players.